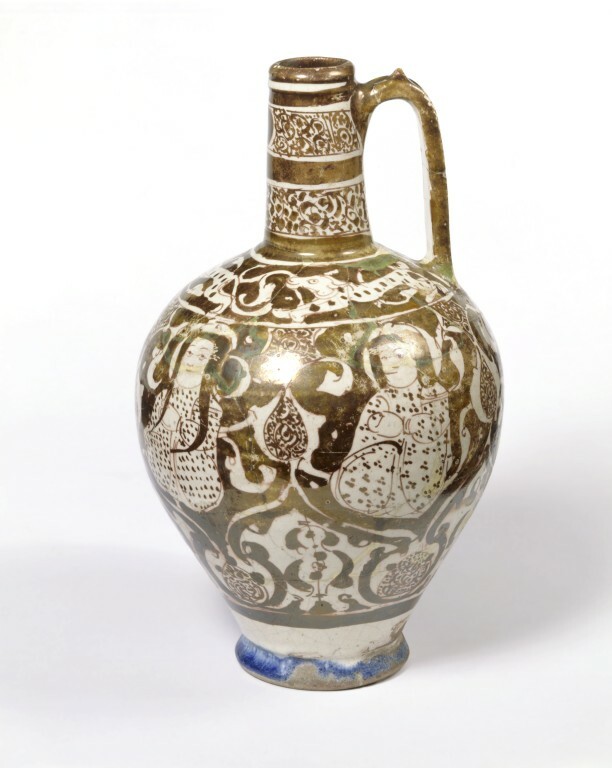 The decoration on this ewer shows how Iranian potters used lustre only for outlines, details and backgrounds. 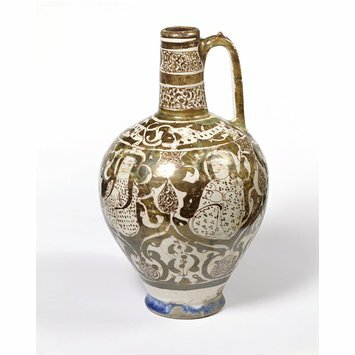 The main motifs, such as the seated figures on this large ewer, were left in white against a lustre ground. The technique of lustre decoration on ceramics was first developed in Iraq in the 9th century. About 1170, the lustre technique was taken from Syria to the city of Kashan in Iran, where this piece was made. With this technique potters made a glazed vessel or tile with little or no decoration in the normal way. When the piece had cooled, they painted a design over the glaze in metallic compounds. The pot or tile was then fired again, this time with a restricted supply of oxygen. In these conditions, the metallic compounds broke down, and a thin deposit of copper or silver was left on the surface of the glaze. When polished, this surface layer reflected the light. Lustre-painted jug with seated figures on body and animals running around shoulder, blue glaze under the foot. Lustre-painted ewer with seated figures, Iran (probably Kashan), 1170-1200. White earthenware painted in gold lustre, with blue glaze under foot. PERSIAN (RAYY); late 12th or early 13th century. About 1170, the lustre technique was taken from Syria to the city of Kashan in Iran, an important centre of fritware production. The Iranians used lustre only for outlines, details and backgrounds, so that the main motifs were left in white against a lustre ground. Formerly thought to have been made in Rayy.